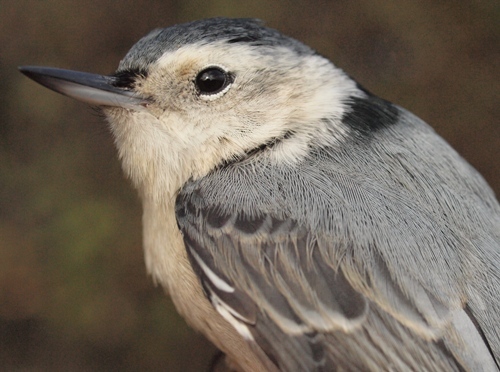 A female White-breasted Nuthatch, a nice way to wrap up the fall 2013 season. Notes: The final week of our ninth Fall Migration Monitoring Program at MBO was a fairly quiet one, as is often the case. While this can make it feel like the season is going out with a whimper, that is actually a good thing, as it reinforces that we are covering the bulk of fall migration with our standard 13-week program. Even so, the 134 birds banded this week were the fewest in week 13 since 2006 when we had only 94, but weather was much more of a constraint in that case. However, thanks largely to the great counts of early fall migrants, the season total of 3341 is close to what we had in 2005 (3226), 2006 (3268), and 2009 (3390), and slightly above our "normal fall" average of 3269 (excluding the counts of 5101 in 2008 and 6807 in 2010 that were inflated by exceptional numbers of Yellow-rumped Warblers). While the number of species observed was well above average for much of this fall, the 53 species observed in this final week of the season were fairly typical. However, the total of 147 for fall 2013 is the third highest in nine years, behind only the 149 recorded last fall and 151 in 2005. 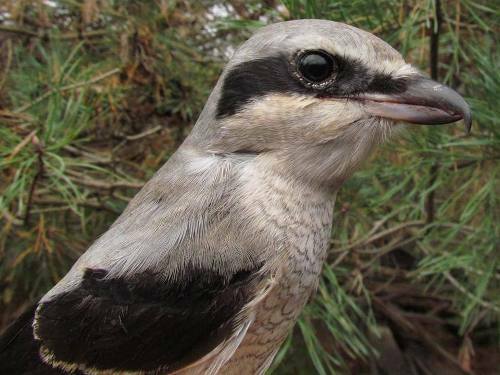 This year's final-week-of-fall Northern Shrike, almost an annual occurrence at MBO. True to tradition, despite the late date we were able to add a few season firsts in the final week of fall 2013. On October 25, we had sightings of a couple of "winter finches" - Common Redpoll and Evening Grosbeak. Considering that Common Redpolls are expected to largely stay north this year after last winter's exceptional southward movement, we were quite fortunate to spot a flock of 18. Meanwhile, our friends at l'Observatoire d'oiseaux de Tadoussac have started a new project tracking two other "winter birds", Bohemian Waxwing and Pine Grosbeak, by colour-banding both species. If you spot any birds that might be from their project, please take the time to report the sightings through their website at ootboreal.wordpress.com. The final new sighting of the season at MBO was one of our late fall specialties, Northern Shrike. It was also banded, becoming the 77th species of the fall, a full 10 species fewer than fall 2012, but otherwise typical compared to our first seven years of operation. Except during last winter's redpoll invasion, we have rarely seen a banding period so thoroughly dominated by a single species as we did this week, with more than ten times as many American Robins banded than the second-most common species, and accounting for 68% of the week's total. However, the results are remarkably similar to the final week of fall in 2007, when we banded 99 American Robins out of a total of 152 birds (65%), and also had 8 American Tree Sparrows (although that year, Black-capped Chickadee slipped in between them for second place, with 15 banded). The rest of this week's top ten consists of small numbers of many of the late season regulars at MBO - White-throated and Song Sparrows, Ruby-crowned and Golden-crowned Kinglets, Blue Jay, Black-capped Chickadee, Hermit Thrush, and Slate-colored Junco. For a second week in a row, it is worth noting the remarkable scarcity of juncos - just three banded, compared to a long-term average of 57, although the species does seem to fluctuate between low years (9 in 2006, 4 in 2007, 12 in 2011, 18 in 2012) and high ones (79 in 2005, 94 in 2008, 175 in 2009, 66 in 2010). Also notable for its scarcity this week (just one banded) was Fox Sparrow, which has been in the top ten banded for week 13 in six of eight previous years, with a mean count for the week of 10 individuals. American Robins also finished out the season strong in terms of total number of individuals observed, taking top spot for the week as in 2008 and 2010. Following closely behind and in a tight pack were European Starling, Red-winged Blackbird, and Canada Goose; together these top four species accounted for a mean daily count of nearly 900 birds. As has been the case in many previous years, Common Grackles remained a big part of the mixed blackbird flocks for much of October but largely moved on before week 13, even though the Red-winged Blackbirds and European Starlings stayed behind a while longer. As was noted last week, the local crow flock is exceptionally small at present; over the past eight years, the mean daily count during week 13 has ranged from 115 to 275 (mean 172), so the count of 32 this week represents a significant deviation from that pattern. Black-capped Chickadee numbers were a touch lower than last week, but still rose higher up the list since other late-season migrants are getting scarcer, including Blue Jay and White-throated Sparrow. As reflected in the banding totals, juncos are scarcer than usual at this time of year. The late season flights of Ring-billed Gulls noted the past couple of weeks continued into late October, although in smaller numbers. Although many saw-whet banders in eastern North America have been disappointed with numbers this fall, it has been a good season at MBO, with 160 banded to date. 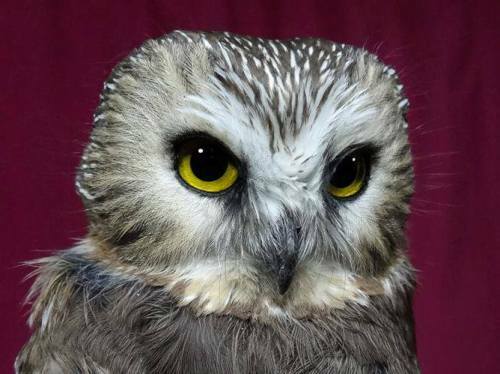 We are now well past the typical peak of owl migration, yet still had another good week with 30 more Northern Saw-whet Owls banded this week, for a season total to date of 160. We also had another two foreign recaptures, making 18 for the season, compared to 16 across all previous years. This largely reflects the record number of saw-whets that many banding stations in the east banded last fall. Also this week we had another same-season recapture, with a Vermont bander reporting a saw-whet on October 24 that we banded 16 nights earlier at MBO. Although we will continue owl banding for one more week, it is apparent that this year's flight is dominated by second-year owls (roughly 60%), with a minority of hatch-year individuals (just under 20%). The final numbers will be reported in the 2013 MBO annual report. As always, the Fall Migration Monitoring Program had both highlights and disappointments, but above all we are grateful to our dedicated team of volunteers for making it possible. There were nine species this fall of which we banded 100 or more individuals, with Ruby-crowned Kinglet leading the way (347) followed by Magnolia Warbler (284), Song Sparrow (268), White-throated Sparrow (262), Tennessee Warbler (248), American Robin (236), American Redstart (146), Yellow-rumped Warbler (108), and Golden-crowned Kinglet (101). Three of those totals (Magnolia Warbler, Tennessee Warbler, and Golden-crowned Kinglet) were new record highs for fall; also setting new records were Cedar Waxwing (91), Cape May Warbler (45), and Bay-breasted Warbler (10). More summaries and analysis will be compiled in the 2013 MBO annual report, which will be available close to the end of the year. Meanwhile, we will continue to provide periodic updates over winter, until the Spring Migration Monitoring Program kicks into gear again at the end of March. 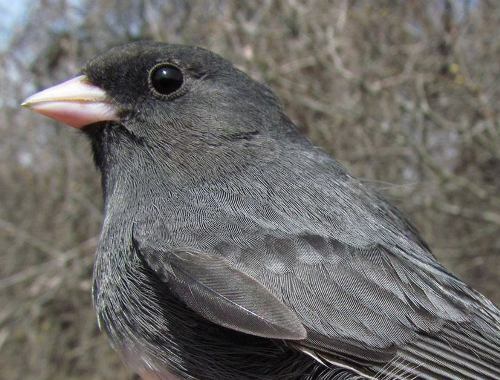 Like 2006 and 2011, it was a quiet fall for Slate-colored Juncos at MBO, with only 60 banded (compared to a fall mean of 214) and only small flocks observed. 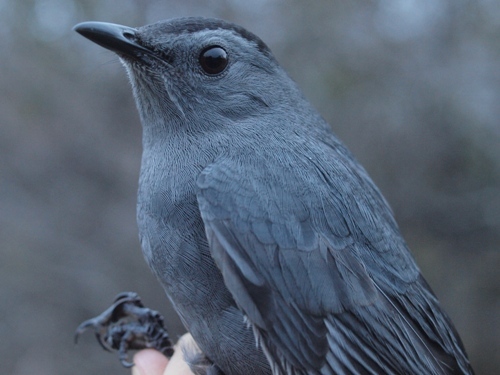 Finishing out the season with a surprise, this Gray Catbird banded on our final morning of banding (Oct 30) was the latest ever fall observation of the species at MBO.